Traditional dinish architecture. All photos by Jessica Cantlin. 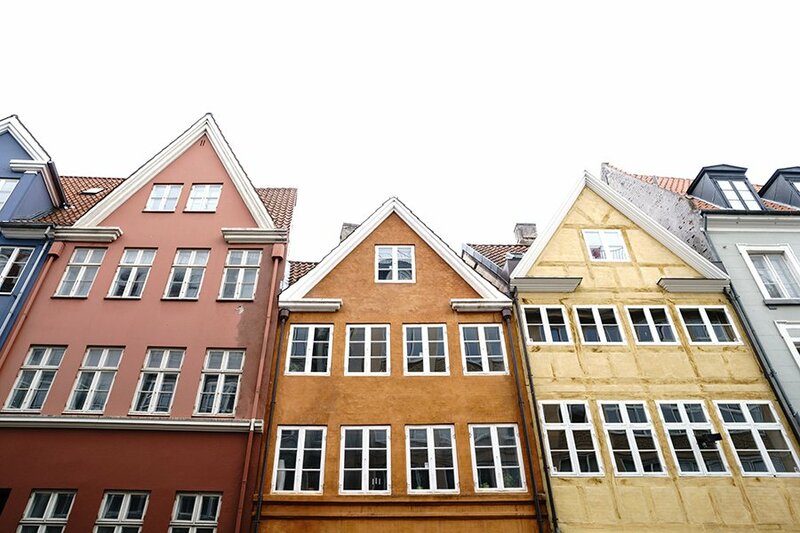 In recent years, Copenhagen shot to the top of everyone's must-visit list. The city shows no signs of losing its steam. 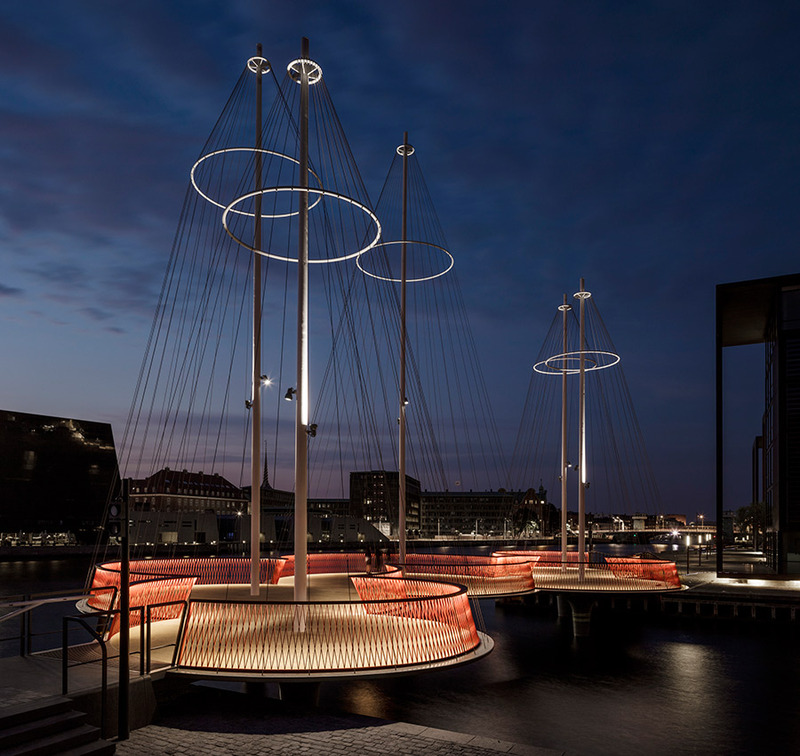 COPENHAGEN, Denmark – The center for Scandinavian design and architecture, and the birthplace of new Nordic cuisine, Copenhagen is on everyone's radar — for good reason. The beautiful city crisscrossed by waterways and populated by smartly dressed Danes riding bicycles (who wouldn't be caught dead riding in Spandex) is every bit the picture-perfect image of a cosmopolitan European capital. Whether you go for the food, art, or design, be prepared to fall in love with the lifestyle and the vitality of this incredible city. Who knew the cemetery would be a good place for a picnic? Cirkelbroen. Photo by Anders Sune Berg / Courtesy of Nordea-fonden. A trip to this beautiful church on the outskirts of the city is a must. Go early in the morning when no one is there and walk down the aisles admiring the simple sandstone bricks of the incredible structure. Designed in 1921 by Peder Vilhelm Jensen-Klint and finished by his son Kaare Klint in 1940, Grundtvigs Church is an exceptional and rare example of Expressionist architecture. Denmark's most visited museum is home to a large collection of contemporary and modern art, including works by Warhol, Lichtenstein, Picasso, and Hockney. The museum also has an expansive sculpture garden with ancient trees and views of the sea. One of Copenhagen's top contemporary art galleries featuring mostly American artists working in drawing, painting, and printing. Rent a solar-powered boat and go on a self-guided tour of Copenhagen's canals. The 17th-century Round Tower, originally built as an astrological observatory, affords substantial views over central Copenhagen and is an excellent example of 17th-century Danish architecture. The public square in the heart of the Norrebro District is a great spot to relax and take a break. On weekends, you'll find markets selling vintage and new items all over. Since most retail shops are closed on Sunday, the street markets are a good way to get your weekend retail fix. On a nice day, the beautiful cemetery is a wonderful place to stroll, picnic, and laze in the sun. Cocktails at Copenhagen Street Food. On the menu at 108. The lovely little café perched on the eastern edge of the city center is best known for its avocado toast. (It's officially a global It food.) If they are out of avocados, don't worry: The entire menu is great, from yogurt with fresh fruit and nuts to radishes with butter and salt to perfectly coddled egg with fresh-pressed juice. Although breakfast at Hotel SP34 is pretty great, Atelier September is where you'll find me. Copenhagen has a great reputation for coffee, and Coffee Collective is known for roasting and brewing the best beans in town. 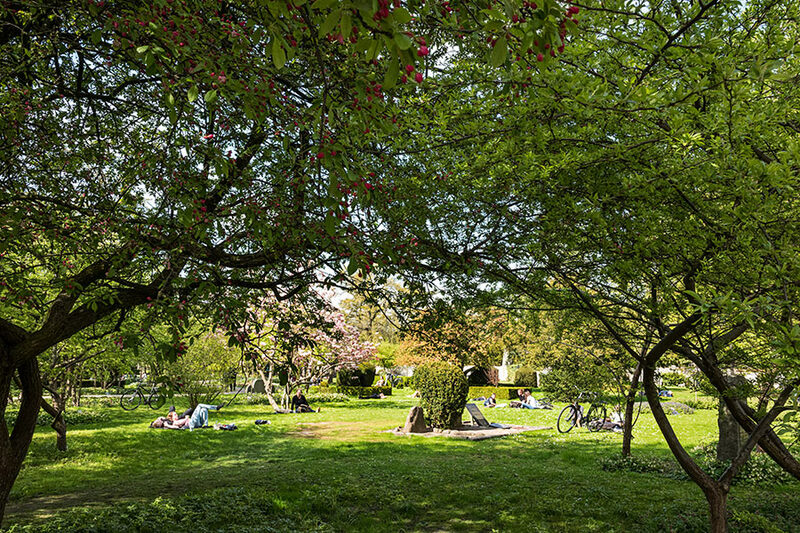 There are three outposts around town, including in Frederiksberg, the enclave surrounded by Copenhagen. Note: Coffee Collective offers an international monthly subscription at a great price. Across the new bridge that connects Nyhavn with Christianshavn is Papiroen, where a large warehouse contains all of Copenhagen's amazing food trucks. Open year-round, Copenhagen Street Food is a great place to explore, enjoy a meal, or sip on an inventive cocktail. It's at its best when the sun is out, as the picnic tables along the water have wonderful city views, but the warehouse is also a good place to hunker down on a dark Nordic day. Nothing is better than an al fresco chef's lunch at Manfred's. The kitchen showcases fresh, organic Nordic fare and serves amazing vegetable dishes. From pickled mussels with turnips and seaweed to a salad of shaved fermented mushrooms and potatoes, everything I tried was delicious. The surprising feature of the menu is the house special of beef tartare — an absolute standout. The wine list features an interesting selection of organic and unfiltered wines, most of which are offered by the glass. Meals are served family-style, so be prepared to share. Don't be surprised if lunch at Manfred's ends up taking up most of the afternoon, as there is no better way to spend it than enjoying a fantastic meal in the sunshine on a quaint street in Copenhagen. 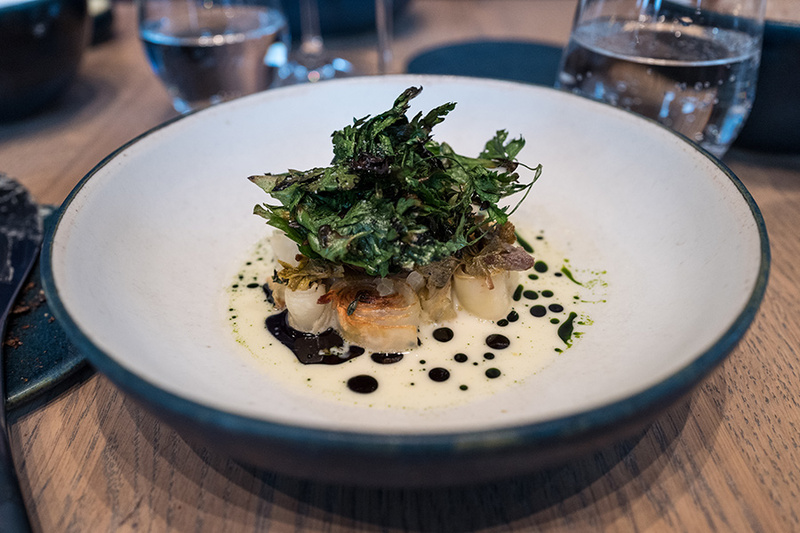 Brainchild of NOMA alum Kristian Baumann and his business partner, NOMA founder René Redzepi, the beautiful new restaurant on the banks of the Christianshavns Canal has already earned its first Michelin star. Like NOMA, the food at 108 focuses on found and foraged ingredients cooked in such traditional Nordic methods as pickling and fermenting. While vegetables definitely shine, slow-braised meats and fresh seafood also play a prominent role. And whereas tables at NOMA were nearly impossible to reserve and the food was seriously refined, a meal at 108 feels accessible, inviting, and more palatable to a greater audience. Don't think that 108 is second-best to NOMA: It stands in a category all its own. Also of note is the restaurant's coffee shop, which sells fresh-brewed coffee and pastries baked in-house. At 7 p.m. on a Saturday night, Baest is bustling. 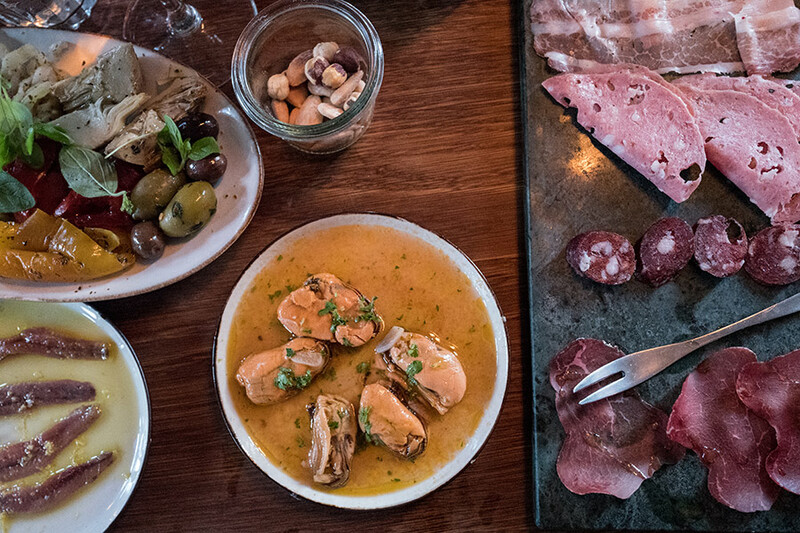 The second restaurant from Italian chef Christian Puglisi serves delicious, organic wood-fired pizzas and meat, as well as house-made charcuterie and mozzarella. Food is served family-style, and a private room upstairs is available for large parties. The mood at The Barking Dog is cozy and vintage. Photo courtesy of The Barking Dog. Tucked in an alley off a main street, Lidkoeb is a cozy cocktail bar occupying three floors of an old apothecary building. If the weather is nice, enjoy a cocktail in the cozy courtyard. Tip: Lidkoeb takes reservations, so plan ahead to avoid waiting. A casual yet elegant wine bar serving vintages from small, cult producers. The excellent, simple menu is served daily except Monday, when the one-pot staff meal is available to everyone. 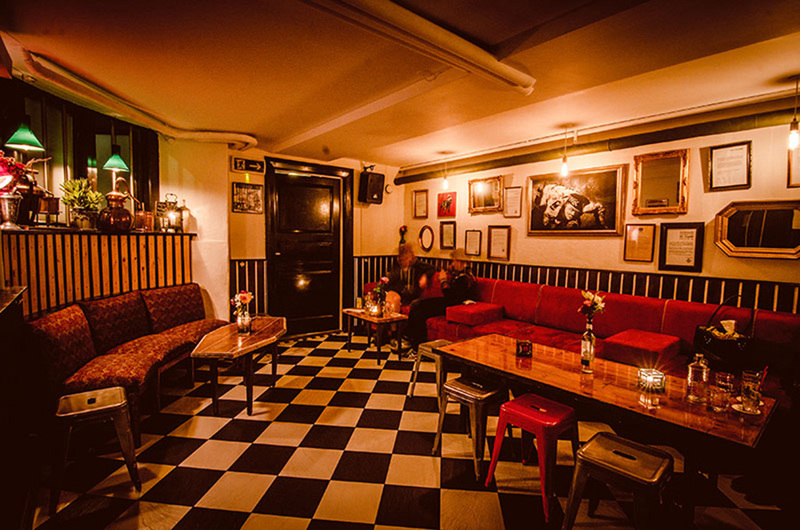 The bar draws a late night crowd for its inventive craft cocktails. 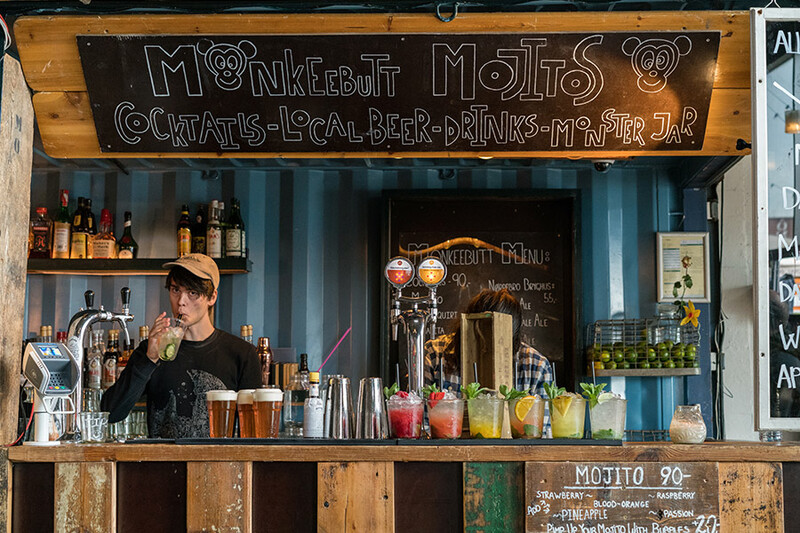 A neighborhood pub with a large selection of tequila and mezcal. Cozy, candlelit, neighborhood bar known for its live music. Danish design: So simple, elegant, and beautiful. Photo courtesy of Hay House. Souvenirs you'll want to bring home. Photo courtesy of Karamelleriet. Choose your spirit at Torvehallerne. Photo by Jessica Cantlin. Nothing beats shopping the powerhouse Scandinavian label's archive shop, where single pieces from past collections are dramatically discounted. You'll find lots of leather, denim, and special items that are no longer available. A small boutique with a selection of international and Danish designers along with their eponymous line of thoughtfully cut pieces made from wonderful fabrics. A lovely interiors shop selling unique ceramic pieces in a rainbow of colors, as well as a small collection of jewelry, handbags, and other gifts by leading Danish and international designers. You can't leave Copenhagen without a stash of licorice treats. Especially since it's impossible to pass the eye-catching window at Karamelleriet without ducking in. 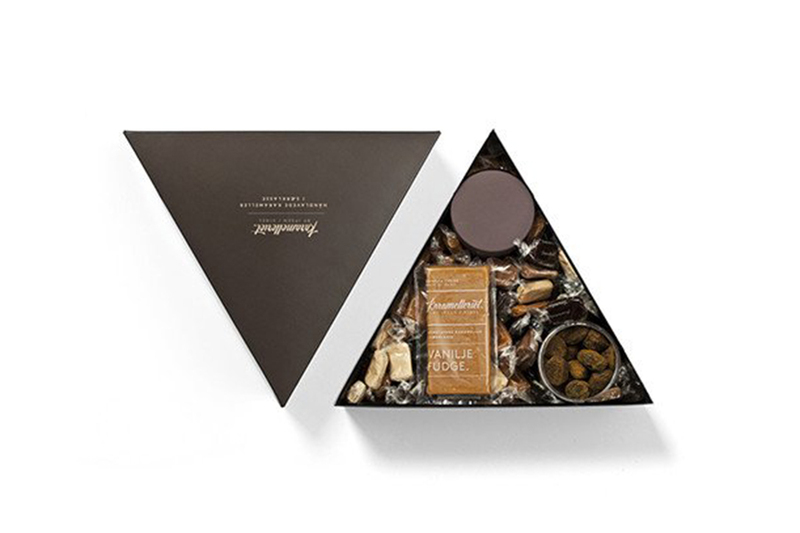 Sample incredible caramels and candies, then leave with a bag full of goodies. A clothing and design store showcasing high-end international labels such as Celine, Haider Ackerman, and Alexander Wang. Notable too for its excellent collection of literature focused on Scandinavian style and design. 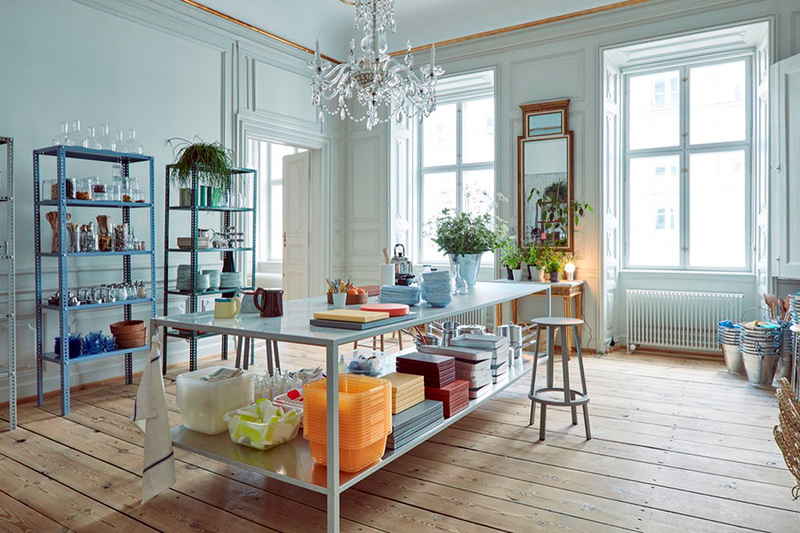 A beautiful variety of Danish modern design displayed over two floors in two locations. Shop here for tabletop pieces, furniture, textiles, and interesting stationery and writing utensils. Women's clothing boutique selling an expertly curated collection of high-end international and Danish fashion. Norse Projects also sells a great variety of cutting edge sneakers. 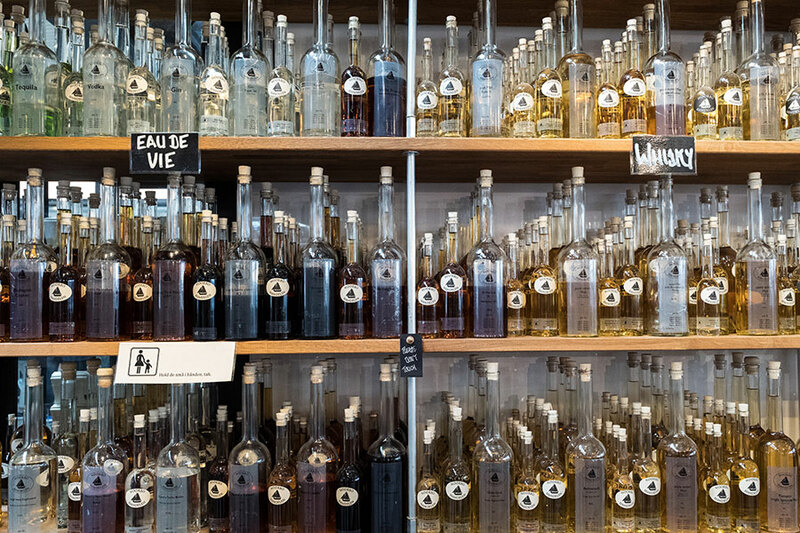 Copenhagen's indoor food hall is the home to independent shops selling everything from ready-to-eat food and home goods to flowers and produce. This is the perfect place to score special and locally souvenirs, as well as lunch for the plane ride home. Shop here for great T-shirts in solids and stripes. One size fits most. A deluxe superior room at SP34. 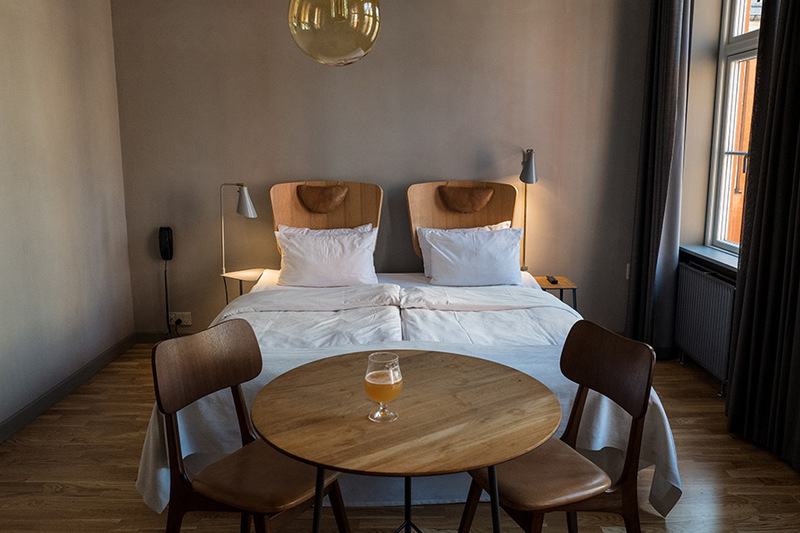 Located in the center of the city and thus perfectly situated for exploring Copenhagen, the mid-sized boutique Hotel SP34 brims with character and comfort, from the beautiful breakfast room with plants cascading from the ceilings and walls to the complimentary wine hour every evening at 5 p.m. The sparsely furnished rooms are filled with natural light and have comfortable beds with down duvets. The views overlook the street below or the lovely interior courtyard. I recommend the latter, as the street can be noisy. If walking through the city doesn't satisfy your exercise fix, the hotel has a small gym with weights and cardio machines. Reception is incorporated into the bar area, which is always busy and staffed with friendly and knowledgeable hosts who can help with restaurant reservations, taxis, and any other request. Come for a couple of nights like we did, or stay awhile. SP34 is perfect for business and leisure travel. Most major airlines fly into Copenhagen (CPH), though Icelandair usually has great fares connecting through Reykjavik (KEF). No need to rent a car. While Uber is no longer allowed to operate in Copenhagen, taxis are plentiful. The best way to navigate the city is by bike or on foot. Bike rental shops populate the city. The hotel will happily set one up for you. The currency in Copenhagen is the Danish Kroner — not the euro, which is currently trading at 6.1 to the U.S. dollar. Jessica is a landscape photographer and travel writer from Seattle. You can follow her adventures at and on . She travels for the simple pleasure of seeing new places, meeting interesting people, and experiencing unique landscapes.